1. The Cobra Company Marine Huey resin conversion set #48016 for the Italeri UH-1N, which was released a week or so ago, includes instrument panel, centre and overhead consoles, armoured seats, rotor brake, VCR, interior bulkhead detail, FLIR turret, IR jammer, laser detector pods, missile detection sensors, landing light, and GPS antenna; totalling 26 highly detailed and finely cast parts. 2. An unofficial post on rec.models.scale says that Cobra Company are working on an external detail set for the 1:48 Mi-24 Hind to complement the existing cockpit detail set. This will supposedly include exhaust IR supressors and IR jammer. 3. The Cunarmodel 1:72 resin A129 Mangusta now has a price, a cool Ј23 from Misterkit in Italy. 4. The bookshelf update in the September issue of Scale Aviation Modeller International has news of a 124 page book 'Army Aviation in Vietnam 1961-1963'. The subtitle on the front cover, which also carries a picture of an H-21, is 'An Illustrated History of Unit Insignia, Aircraft Camoflage and Markings'. The author is Ralph Young, and the publisher is The Huey Company Inc.
6. Hannants have also posted the Hasegawa boxart photo for the new US Army 'Special Markings' AH-64A. As far as I can see from this picture, the Apache has no markings on it at all ! However, there is a scan of the decal sheet at Hobbylink Japan. This shows various strange items including blue & white roundels and flashes, the text 'ES1007' (where the S is the Greek letter sigma) and some 'rising sun' artwork. 7. Coming soon from Eduard is a detail set for the Revell Alouette II (32-045). 8. Check out the latest additions to Antony Morgan's Model Heli-Roto-Gyro-Page, including pictures of my attempt at the Top Gun Mi-14PL. 9. The new Polygon '50 years OKB Kamov' book was published at MAKS'99 in Zhukovskii last week. The book is a monster (375 pages) and is expensive, even by western standards. Kamov sponsored the book and had considerable editorial control over its contents; they have also acquired a large portion of the print-run. Linden Hill will be importing a very limited number of volumes and expect them to cost at least $55. Contents include all Kamov designs from 1948 up to the Ka-60 Kasatka and Ka-137 UAV, most designs being accompanied by excellent 1/72 scale plans from Alexei Mikheev. There is a comprehensive introduction in English. 10. The new Mir Aviatsii (2/99) includes an illustrated article on Mi-6, Mi-8 and Mi-26 transport operations at Grozny in 1995 during the Chechen War. It is available now from Linden Hill, or from Tushino Aviapress. 11. Video producer Krilya Rossiya (Wings of Russia) has just released an excellent CD-ROM on the Ka-50 and Ka-52. 12. Non-news. 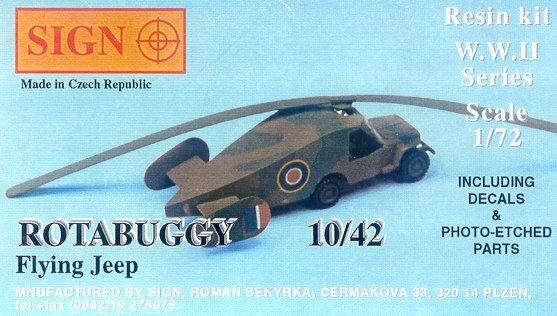 One of the advertisers in Scale Aviation Modeller International is listing a new Pavla 1:72 'Flying Jeep'. Don't be deceived (as I was) into the assumption that this must be the Hafner Rotabuggy/Rotajeep, as previously kitted in resin by Sign. It is in fact the fixed-wing Curtiss AT-9 'Jeep'. Thanks to Tony Morgan, and Guy Holroyd.